The usual English meanings, i.e., interesting meaning holding the attention; arousing interest (Merriam-Webster Online Dictionary), and uninteresting meaning otherwise. In Go literature, these terms are often used to indicate whether a move, position, or variation merits additional discussion. Note that this usage says nothing about the goodness of the object in question. Example: "This move is interesting, but playing here is even better." Go-specific meanings, with interesting meaning a mildly positive evaluation and uninteresting meaning a mildly negative evaluation. Such usage usually refers to the outcome of a tactical exchange, opening, or joseki. 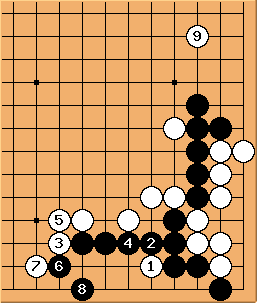 Example: "This position is interesting for Black." The Go-specific meaning of interesting came from the Japanese term 面白い (omoshiroi), while the Go-specific meaning of uninteresting came from the Japanese terms 面白くない (omoshirokunai) or 詰まらない / つまらない (tsumaranai). Incidentally, the Japanese terms as used in the Go literature have deviated from the normal Japanese usage (see definitions below). Because some dictionaries list interesting as a translation for 面白い, many Go translators have adopted that word, often not even realizing that the word has a Go-specific meaning. As such, these English terms have acquired these Go-specific meanings as well. A more appropriate English term might therefore be promising or unpromising. Likewise, although the Chinese terms 有趣 (yǒuqù) and 无趣 (wúqù) are direct translations of interesting and uninteresting, they too have acquired Go-specific meanings that are different from the ordinary everyday usage. Although a common joseki move, in this position is the wrong direction. Because of the low strong marked stone , the lower edge is uninteresting. It would be better to take territory with a, pincer with b, or similar. "In the previous diagram, when attaches and blocks, the block of is also playable, connects, connects, and then grabs the vital pincer, it is interesting for White." PeterHB: The phrase "In the previous diagram" in the block above could be misleading. It appears to me that it would be a mistake to directly superimpose the interesting example on to the uninteresting board diagram above. In my opinion, to do so would pre-reduce the effect of white's left facing influence and so would be poor direction of play. So these are really 2 separate examples. This might be clearer if they both had been full game examples.